I think this is completely awesome! I love the art work! Whats better is it seems like this is a man arm. Hello Kitty doesn’t look like this!! Hello Kitty is lovable and cute. And she doesn’t have a mouth so this tattoo is totally wrong. It’s important to respect and love Hello Kitty because when you don’t, blogs like this take advantage of it and try to make her look bad. I know you only posted this to try and make Hello Kitty look bad. You’re not fooling anyone and we can all see what you’re trying to do. Why don’t you ever post all the cute Hello Kitty tattoos? It’s because you refuse to ever blog about what’s good and that’s why this blog can never be trusted!! If you knew your hello kitty facts you would know she actually does have a mouth, when shes not using it it doesnt show. You can see hello kitty with a mouth in her shows for kids. I like Hello Kitty as much as the next HK fan, but Darlene is making the rest of us Hello Kitty fans look bad. 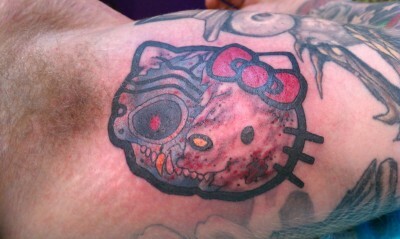 I think it looks more like a “Hello Kitty Borg”. There again, that’s far from an improvement on a Terminator, which will just kill you. Not my cup of tea, but the detail is amazing though…. @xxxn- Darlene only makes herself look bad, most of us either laugh or roll our eyes when it comes to her comments b/c they are so ridiculous that I can’t see how anyone takes this young lady seriously. So please don’t put Darlene and the rest of us in the same catagory. I’m sure everyone, including Darlene, will be highly offended, lol! Sanriobaby, I apologize if I offended you or anyone else on this blog. It was not my intent at all to lump every other Hello Kitty fan in the same category as Darlene. When I was typing this, it was 11:30 at night and I had just taken my nighttime medication so I wasn’t thinking clearly. I have my theories about Darlene who he /she is; the person just is playing the obsessed fan, too deliberate of a writing style unlike your typical troll. Hat off for rattling HK hater cages darlene. as for tattoo, I do not care for it but good job in texturing. That’s okay 🙂 We’ve ALL had our moments when it comes to reading Darlene’s comments….